It feels appropriate on Halloween to post about my favorite candy bar, which incidentally I just ate. It was only the fun sized version, but that’s ok. Although I will gladly eat any number of candy bars if you gave them to me, my hands down favorite is Twix. The combination of the chocolate with the gooey, sweet caramel and the cookie crunch can’t be beat. Plus, since they come two to a package (at least regular sized ones do) it always feels like you’re getting a bonus candy bar even though, let’s be realistic, no one ever eats just one of them at a time. Having also just eating one of the new white chocolate Reese’s peanut butter cups I can tell you that will not be vying for the top spot ever. I even like white chocolate, which I know a lot of people don’t, but let me tell you that was not good. I think I’ll stick with my Twix. Now to come up with another reason to walk by the circulation desk and steal some Halloween candy before the end of the day. This is going to be a very quick post, but I felt like I had to share this here since this blog is all about sharing what’s making me happy. On my way home from the gym tonight I drove by a guy on a motorcycle with a sidecar attached. Riding along in his sidecar with him was a SKELETON wearing riding goggles. How awesome is that? I wish I had a picture. I had to go to Jo-Ann Fabrics tonight to get the last piece of my Halloween costume. Unfortunately the closest Jo-Ann is about a half hour away from my house. On the bright side though there is a Chick-Fil-A right across the street from it. I don’t eat fast food that often and am pretty picky about which fast food restaurants I will eat at unless I have no other option. Chick-Fil-A is one of those. Arby’s is the other. I love Chick-Fil-A. I always get the 8 piece nugget meal with sweet tea. Just the fact that they serve real sweet tea outside of sweet tea country is enough to make me love them, but add in the waffle fries and the wonderful chicken and I’m in heaven. And aside from the food I can honestly say that dining at Chick-fil-A is a real pleasure, something I don’t think I could say about any other fast food restaurant. They definitely train their employees right, and I assume treat them well too because everyone who works there is always so nice and friendly. Not to mention the fact that they employ people whose sole responsibility is to make sure that the dining area is clean at all times and make sure you are having a good dining experience. They will offer to bus your table for you and refill your drink for free. In most other fast food restaurants you’re lucky if you can find a table that isn’t covered in remnants of the previous diners’ meals let alone have someone offer to refill your drink for you. I rarely have excellent customer service experiences that span not only an entire store/restaurant but also across an entire chain. I have dined at many Chick-Fil-As in any number of states and honestly can’t think of a bad experience, so keep up the good work guys and I’ll “Eat Mor Chikin”. I’m actually only about a third of the way through watching Pearl Jam Twenty, which is the Cameron Crowe directed music documentary taking a look back at Pearl Jam over the twenty years since their debut album, Ten, was released. I’ve been watching it a little bit piecemeal today between getting other things done and will probably continue watching the rest of that way as well. So far watching it is making me very happy because it’s making me very nostalgic. I was in 8th grade when Ten was released, and that album totally defines my middle school memories. I don’t think there’s another album that so evokes memories of those years as that one does. Those distinctive opening chords of Jeremy always transport me back to my (much) younger years. Ten was one of the first CDs I ever owned, though it was released during that transition time between cassettes and CDs so I totally remember listening to friends’ copies of it on cassette as well. I honestly am not the biggest Pearl Jam fan. The only other full album I ever bought was their sophomore effort, Vs. That is unless you also want to count the fact that I bought the soundtrack for Into the Wild, which was completely composed by Eddie Vedder. Pearl Jam was the first concert I ever saw in Maryland though. Just a few short days after moving into my apartment, one of my roommates wound up having an extra ticket to the Pearl Jam concert at Merriweather Post Pavilion so I tagged along with her and her friends. I also feel an affinity for Pearl Jam because like me, their lead guitarist Mike McCready also suffers from Crohn’s Disease. He’s pretty much the only celebrity I’m aware of who speaks out about his struggle with the disease and undertakes fundraising efforts on behalf of the Crohn’s and Colitis Foundation of America. Despite my waxing and waning feelings about their music over the past twenty years, Ten will always be a defining part of my childhood. And with that I shall leave you with one of my favorite songs from the album. One of the things I really love about music is how versatile it is. There are so many different genres of music and so many variations within each of these genres that it’s easy to find music to perfectly suit your mood. It’s even easier these days thanks to the ability to easily compile your own playlists in any number of ways. I still remember making myself tons of mix tapes and CDs out of music I owned so that I could easily listen to specific songs together. Today in Baltimore it was gloomy and rainy all day. To me, Bon Iver is perfect music to listen to when you just want to embrace that gloom and kind of wrap it around you like a blanket. That’s how I felt at work this afternoon, so I queued up some Bon Iver and appreciated being able to listen to music that perfectly fit the mood I was in. Since today is my anniversary and I had already planned on taking Monday off because my parents were visiting I decided I would extend my long weekend and take today off as well. I didn’t really use it to celebrate my anniversary though since my husband was still working and he refused to do what I wanted to do in celebration, which was to go see the Footloose remake. The original Footloose is one of my all-time favorite movies. One would think that due to that fact I would want nothing to do with a remake of it. That is exactly how I felt about the remake of The Karate Kid, the original of which I also love. However, for some reason from the moment I heard they were making this movie I was kind of excited to see it. I was a little afraid that I was totally going to regret seeing it, and that the remake would be a complete desecration of my beloved movie. Luckily that turned out not to be the case. This movie is really a remake in the truest sense of the word. It’s pretty much an homage to the original Footloose. I would say about 75% of the movie is taken straight from the original movie from the dialogue, to the choreography, to the set design, to the staging. Some of it was exactly the same in that it almost felt like you were watching the original movie, whereas some of the dialogue was the same but was said over a different setting. The changes they made felt organic to the story and in some cases perhaps made even a little bit more sense than the way things were set in the original. The casting for this movie was excellent. Kenny Wormald did an excellent job as Ren with just enough Kevin Bacon swagger to pay homage to the original character while still making it his own. I had a harder time appreciating Julianne Hough as Ariel at first, but by the end of the movie she had totally won me over. Miles Teller as Willard was inspired. He was like Chris Penn incarnate in this role. His looks and his accent made me almost feel like I was watching a ghost in the role. Dennis Quaid did a fair job of playing Reverend Moore, although I still like John Lithgow in the role much better. The weakest link in my opinion was Andie MacDowell as Vi Moore. She didn’t have a whole lot to do in this movie. I felt like the limited role given to that character even in the original was further diminished in the remake. I also found Dianne Wiest to be far superior in the role. Like everything else previously mentioned it seemed they decided to use about 75% of the music from the original movie, but covered by other artists and often remade into different genres with rap and country being the prevailing musical styles of the music in the movie. I stand behind using new versions of the songs, but I wish they had followed all the way through with and used updated versions of all of the songs from the original movie instead of throwing in a few other random songs. All in all I’m happy I went to see the movie, though it really did just want to make me rewatch the original again. I’m not really sure that it was necessary to remake Footloose, but I think they’ve done it in such a way that younger people who have never seen the original will connect with the remake while also staying so faithful to the original that those of us who love it can enjoy the journey of seeing how they’ve used it to create an updated version. Incidentally, Footloose is the inspiration for one of my favorite episodes of Will & Grace ever, in which Jack is stalking Kevin Bacon but winds up as his assistant. I couldn’t find a clip online that I thought did the episode justice, so you will have to settle for this one that also throws in some random scenes from other episodes. It’s still pretty great though. (Sorry it appears that embedding is disabled on this clip, but I still highly recommend clicking through to watch it on YouTube). My husband likes when I mention him in my blog posts, so he can be very happy today because this post is all about him. On this day three years we got married. It is also just shy of our seven year anniversary as a couple. We started dating at the end of October 2004. We met in May 2004 through a social group in Baltimore called Meetin’ Baltimore, and started dating about 5 months later. About 2 months after that I got sick and turned quickly from a girlfriend who was up for almost anything into one who could barely walk and felt miserable all the time. About 6 weeks after that I got diagnosed with Crohn’s disease and arthritis. Our first Valentine’s Day together was spent with him driving me to and from getting a colonoscopy. Many guys would have run for the door with all this happening that early in a relationship, but instead my husband stuck around and did whatever he could to make me comfortable. Luckily everything seems to be in remission these days, but when the inevitable day comes that that is no longer the case I know I can count on my husband to take good care of me. After being together for four years, we got engaged on my 30th birthday during a trip to New Mexico. 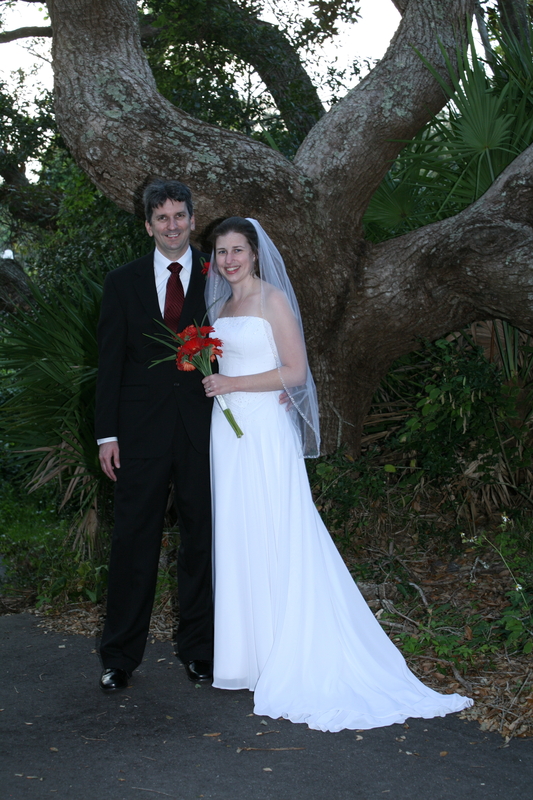 We got married in Florida on the beach and had our reception at my parents’ house 4 months to the day after we got engaged. Now it’s three years later and my husband still makes me happy every day. He’s always trying to take care of me and do things to make me happy. There are of course things that he does that drive me nuts, like never putting in a new trash bag after taking out the trash, but I’m sure I have some habits that make him crazy too. I look forward to many more years sharing my life with him.